NCOA Report: We created a new report which represents NCOA certification. This summarizes the services your file received during processing, and provides details on the Licensee, List, and Output (with blank fields for you to specify your mailer details). This report is similar to the TrueNCOA Report, and includes counts for: Total Records Submitted for Processing, NCOALink (18-month moves), ANKLink (48-month moves), and the various Return Codes. You can read more about return codes in the TrueNCOA data dictionary. Navigate to a file display and click the "NCOA Report" button near the top of the page to view this report. The button is only displayed for files you have downloaded. Login today to view NCOA Reports for your files. Edit Column Headers: We noticed some of our uses were uploading data without column headers, so we made a feature that allows you to add column headers to your data from within the app. 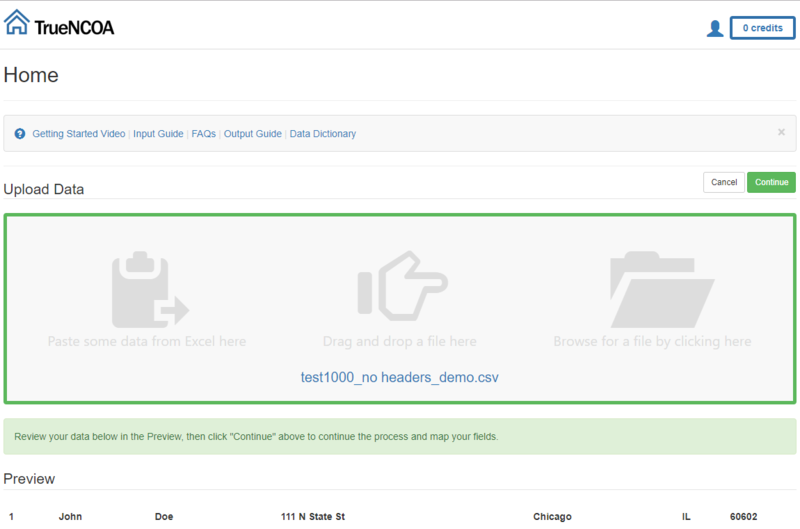 When you paste data into the upload area, or use the Drag & Drop or Browse upload method to choose a CSV file, TrueNCOA allows you to add headers to your data within the app. You can see in the image below that the test file does not have headers because the first record in the data - John Doe - is listed in the preview area. That's where the headers would normally appear. If you processed this file without making changes, the first record for John Doe would be treated like a header row rather than as address data. John Doe's record would not receive TrueNCOA services. If your data does not have header labels, then your first record will be treated like the header row. 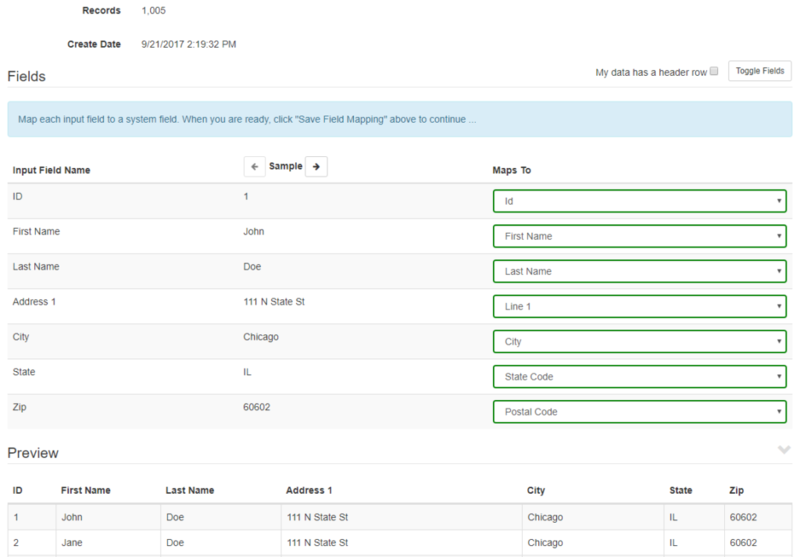 Notice that the Input Field Name contains contains address data from the first, and the Sample column shows data from the second record. 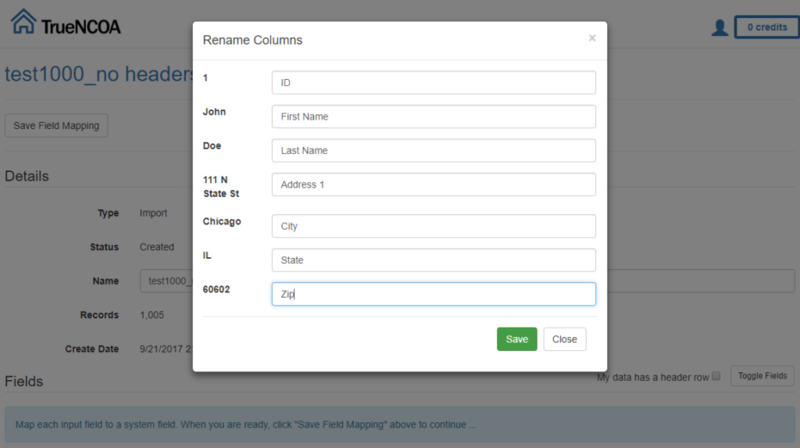 If your data has headers, the Input Field Name column will contain header labels. If your first row of data is actual address data that you want processed, disable the check mark. This will bring up a form that allows you to insert a header into your data. Please note: if your data already has headers and you try to insert new headers, your file will not process normally and you will need to re-process your file. Unchecking the "My data has headers" checkbox will bring up a form like this one. First, enter your header labels in the form like in the example below. 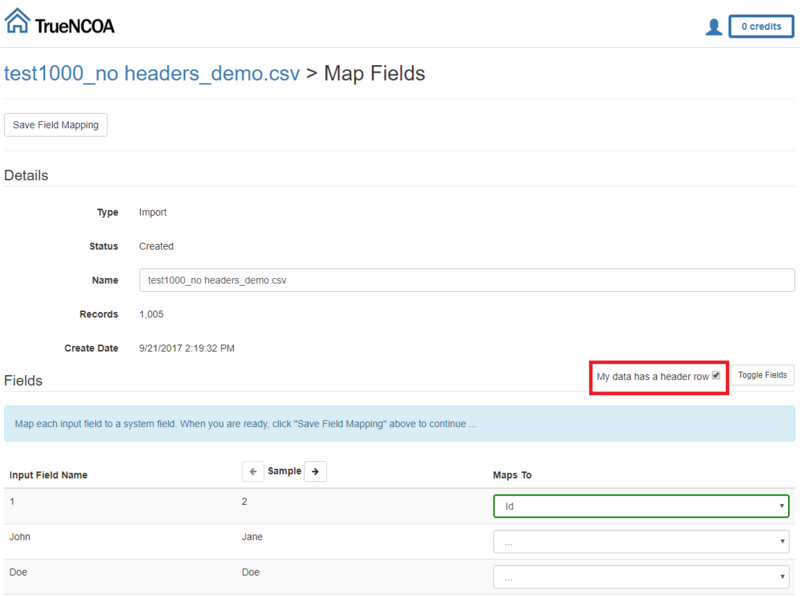 This will help you map your fields more easily. Then, after specifying your header labels, click the Save button. Use this form to specify your preferred headers. This will appear on your download file as your input headers. Finally, make sure to check your preview data before moving forward. If the preview meets your expectations, complete your field mapping, click save, and process your file. Notice that the preview data on the Field Mapping page lists John Doe as the first record and Jane Doe as the second record. Now that you've added a header row, John Doe will be processed with the rest of your data. Downloading Weekly Update File(s): Some users were experiencing an issue when trying to download a weekly update file (read more about how we re-process files to deliver updates here). The issue was prompting users to use a credit to download complimentary re-processed files. We have corrected this issue, and you should be able to download those files without being charged a credit. TrueNCOA Report: Previously, the Percentage of Moves field on the TrueNCOA Report was showing two percentages. We fixed this, so you should only see one value on that line of the report. Updated User Page: Last week we released the User page. Read more about the page here. We discovered that if you had deleted one of your files with a transaction history, the User page would not load. We released a fix for this, so you always have access to the user page whether or not you have deleted any files. If you have deleted a file, the file will still appear in your Credit Usage section. However, the filename will not be linked to the file display page (because the file was deleted).